Teapots and Polka Dots: Lauren Submits a Recipe! A recipe written in your mom's or grandmom's handwriting is a wonderful family keepsake. 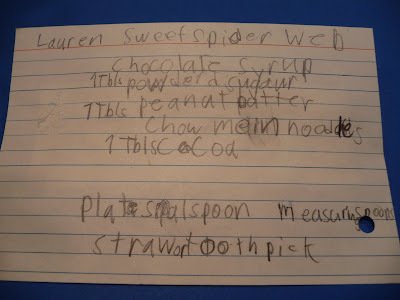 A recipe written by your child is an adorable keepsake. And a whole book of such recipes is precisely what I found when I was rummaging around in my cookbooks recently. (How could I have forgotten it was there?!) 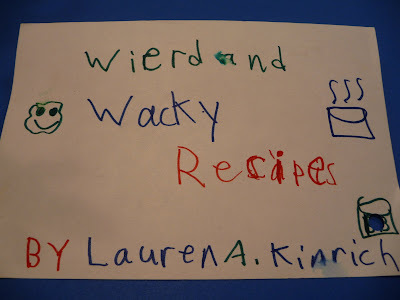 Here's the cover (below) for a cookbook that Lauren faithfully copied out and illustrated when she was in grade school. 1. Squeeze a small circle in the center of the plate with the chocolate sauce. Draw another circle around the first one, leaving at least 1/4 inch between the circles. Draw several more circles around the first two. 2. To make the web, place a toothpick in the center of the chocolate circles and drag the toothpick through the second and all the remaining circles, toward the outside of the plate. Continue making more spokes until it looks like a complete web. Set aside. 3. Sprinkle cocoa in a small dish and set aside. 4. Mix the peanut butter and the powdered sugar together in the bowl. Knead and mix the peanut butter and sugar together with hands, forming two balls, a large one for the spider's body and a small one for its head. 5. Gently roll the balls in the cocoa to make the spider's body look fuzzy. 6. Stick 8 chow mein noodles into the spider body to create legs. 7. 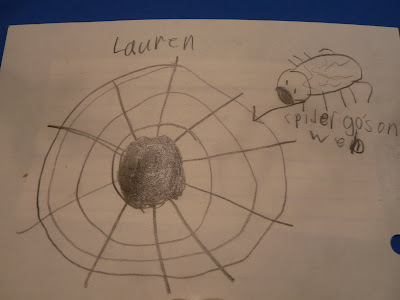 Place the spider on the web and serve for a sweet dessert! Awwww! By the way, if your children (or nephew or nieces or neighbor's children) have cute recipes like this, they make great art, framed and displayed in the kitchen. Thematically appropriate, as my family would say. It's chilling to realize that Lauren really hasn't changed at all, isn't it? Just the other day she asked me if something "go's" here.